Microsoft is changing the name of its Twitter Feed. You will automatically remain a follower of its news feed, as this is just a name change to more accurately reflect the content of the feed. @MSFTnews will be the home for all of the news, stories, testimonials and trends about Microsoft’s consumer products and services – Xbox, Windows 7, Bing, Windows Phone 7, Kinect, Halo: Reach, and more. This new consumer feed will be taking over our old twitter handle — @microsoft. To automatically follow the new @microsoft, just go to this current Twitter site, @ExperienceMSFT. The name of this site will change to @microsoft on Monday. If you sign up to follow @ExperienceMSFT now, you will automatically move to the new @microsoft. @microsoft is reborn as the new consumer-products focused location. You must sign up, join, or follow @ExperienceMSFT now to automatically switch on Nov. 3rd. 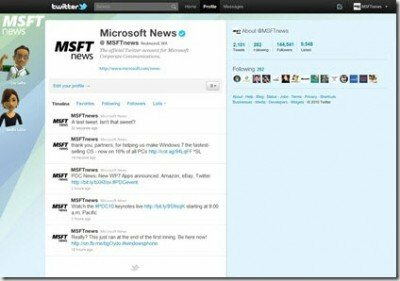 You may also want to check out the list of Official Microsoft Twitter accounts. And if you want to stay in touch with all that may interest a Windows user, @TheWindowsClub is another great account to follow! Feel free to share your Twitter handle below if you love to tweet about Microsoft or Windows.